We are providing you with these 12 items to help your student group organize a successful presentation. Please visit each of these pages. Print out the check list and provide a copy to each volunteer in your campus organization interested in helping with the presentation. You can also use the paintings, drawings and logos on your promotional materials. You may want to not only use them on flyers and posters but on electronic billboards and other campus media. You can also book interviews with Keith McHenry on your campus radio station and news paper before the presentation. Send out the PSA to not only compus media but to local news papers, radio stations and other media in your community. Thanks so much for all your work to reach the media and classmates. You can provide these 12 materials to the members of each sponsoring student group. These student groups can request funding for an honorarium which is donated to Food Not Bombs. Colleges have provided Food Not Bombs with speakers fees ranging from $900 to several thousand dollars. It is important to request the speaker fee and transportation money as soon as the fall semester starts. Young Republicans and other conservative groups can take all of the student activity funds if you hesitate. We are happy to help you navigate the student government system at your school. Call us today at 1-800-884-1136. You can download a sample black and white flyer and add the date, time and location of the presentation. You can also download a sample full color flyer, and sample public service announcement to provide to your campus radio station and newspaper. You may want to also email or fax this same PSA to radio stations, newspapers and magazines off campus. You could send them this information as soon as you confirm the venue, date and time and resend the PSA again a week before the event. Follow up with a phone call. They may ask you to send the details to a number of people at each media location. We will also provide you with the forms you will need to request the honorarium and a check list to help you and your friends organize the presentation. We make it easy to attract a big audience and encourage your classmates and community members to join you in organizing for a better future. It is more important then ever to bring the Smashing Hunger Squashing Poverty Tour to your community! The Smashing Hunger Squashing Capitalism Tour starts with a literature table during lunch at your schools cafateria followed that afternoon or evening by a 45 minute presentation about the history, principles and the current actions of Food Not Bombs taking place around the world. Keith will also demonstrate the making of the tofu spread recipe featured in his book. 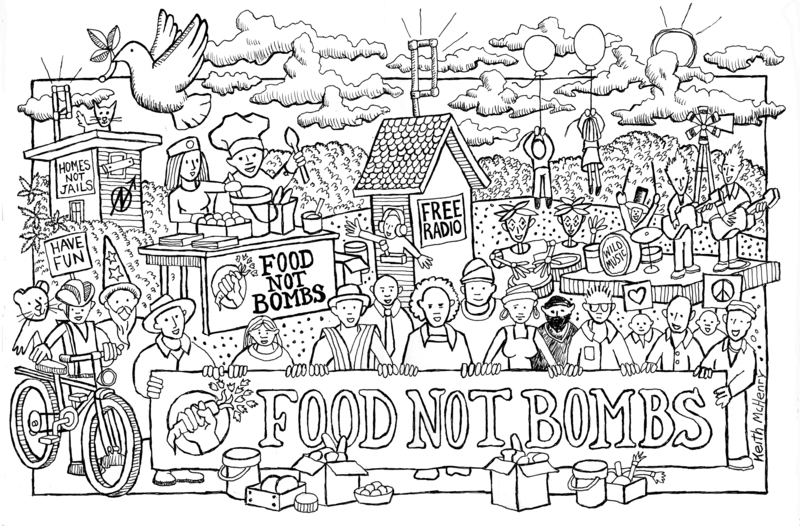 The presentation explains why Food Not Bombs has no formal leaders and is able to be so effective because of its decentralized autonomous structure. The presentation also explores the principles of nonviolence, how decisions are made by consensus, the philosophy on why the meals are always vegan and free to anyone who wants them without restriction. The presentation ends with a 15 minute video about Food Not Bombs in Africa. You may want your club organizers to share dinner with Keith before the presentation. Your classmates and community members will be inspired to join your student group after they attend this exciting presentation. 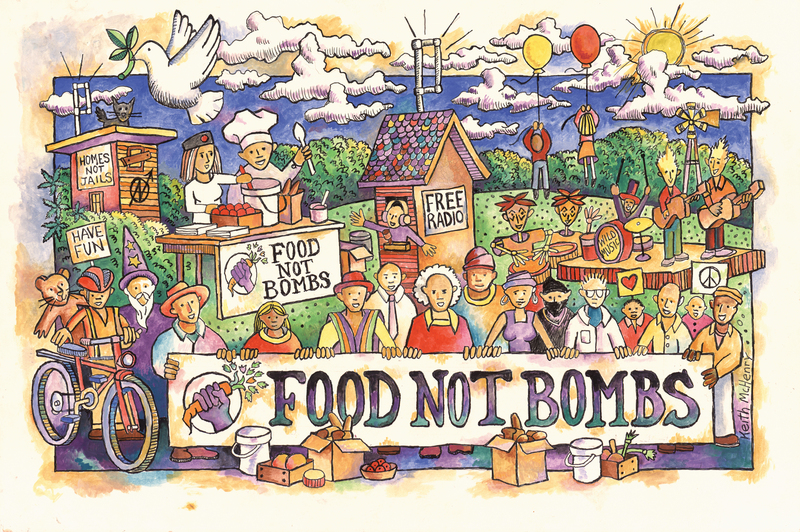 Again schools have provided Food Not Bombs with honorariums from $900 to several thousand dollars. The presentations are always free to Food Not Bombs groups. Talk with the other student organizations on your campus and ask them to help host the Smashing Hunger Squashing Poverty Tour. 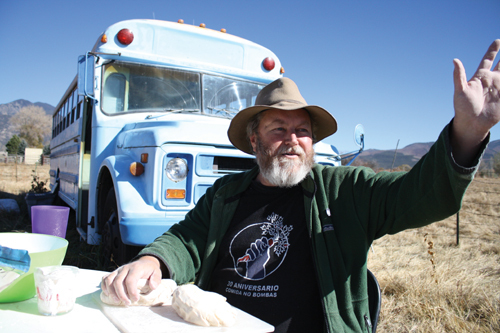 Learn more about THESMASHING HUNGER SQUASHING POVERTY TOUR and Keith McHenry's 30 years of community organizing. Your community will find Keith's message hopeful, motivating and full of useful information sure to be an inspiration to everyone. If you don't have a local Food Not Bombs group in your community you sure will after Keith's presentation. If you want to increase the activities of your local chapter the presentation is a great way to get more volunteers. You can call Keith directly at 575-770-3377 or email him at menu@foodnotbombs.net to make arrangements. You can also call us toll free at 1-800-884-1136. Keith is honored to give a free presentation for any Food Not Bombs group. Please contact us for more details.